Fri, December 21, 2018 | Welcome, reader! 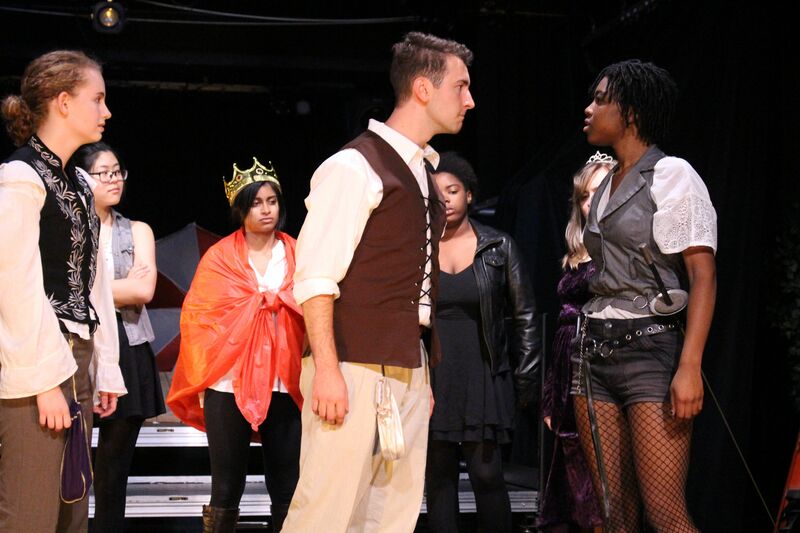 McLean Cozine ’20, as Guildenstern, confronts Ali Bennett ’18, the lead player, an ongoing antagonism throughout the play. I am still trying to figure out what exactly “Rosencrantz and Guildenstern are Dead” is about. But perhaps that in itself is exactly what the play is about. The Green Room’s rendition of Tom Stoppard’s quirky, absurdist piece, which is a modern extrapolation on the eponymous “Hamlet” characters, embraced the original’s questioning and ambiguous air in its production last Saturday and Sunday night. The show was put on by a small cast and crew of under 20 people. Senior Michael Barnett directed the group after pitching the play to The Green Room’s executive board. Barnett fell in love with the play after seeing it performed professionally in Sydney, Australia. He explained that the Sydney production made clear the importance of understanding the complex themes and questions the play poses. After seeing his production and speaking to Barnett, it is clear that he understands and walks the fine line Stoppard poses between humor and gravity. “One thing that I really like about it is that it’s a comedy for the vast majority of the play; it’s very funny, but then at the very end, it’s very depressing,” said Barnett. The play certainly did dance back and forth between comical and contemplative. One particularly stark example of this is the recurring play on the fact that in the original “Hamlet” Rosencrantz and Guildenstern are indiscernible. Because of this, Rosencrantz and Guildenstern themselves cannot differentiate between one another. While comical, the jokes simultaneously raise questions of reality and acting and how we know what makes us ourselves. As the play tackles these large questions of existence and reality, it wanders through an amorphous, airy plot that is loosely tied to location and time. The wandering of the play’s timeline itself reflects Stoppard’s feelings of life’s lose drifting nature. One piece of the abstract message that Barnett cleverly grounded was Stoppard’s questioning of the meta-theatre. “I want to blur that line between what is reality and what is the play within the play, and what is the play within the play within the play … draws the suggestion that the world we’re living in is also theatrical,” said Barnett. Besides his emphasis on the traveling acting troupe and the exaggeration of the scripted lines about actors’ roles in the world, Barnett aimed to blur this line between what constitutes the play and what constitutes reality by orienting the theatre in the opposite direction from normal. The audience sat where the stage normally sits. “I think it is actually cool because it is suggesting the meta-theatricality, of the fact that we are all in a play as well as the actors in the scene,” Barnett said. In this respect, Barnett and the cast and crew of the play did exactly what they set out to accomplish. They posed broad overarching questions of existentialism, and gave audiences tidbits of answers. Yet, as is with any good question, these large questions only sparked more questions stemming from them. Audiences are left feeling like Rosencrantz and Guildenstern themselves, playing a cyclical game of asking questions, answered only with further, deeper questions.